وجه العملة تمثال الملكة إليزابيث الثانية من تصميم الفنان إيان رانك برودلي وعبارة "Elizabeth II Australia 1 Dollar"
ظهر العملة كنغر يقفز مع وجود خطوط وعبارة "Australian Kangaroo 2016 1 oz 9999 Silver"
تمثال الملكة إليزابيث الثانية من تصميم الفنان إيان رانك برودلي وعبارة "Elizabeth II Australia 1 Dollar"
كنغر يقفز مع وجود خطوط وعبارة "Australian Kangaroo 2016 1 oz 9999 Silver"
1oz 2016 Australian Kangaroo Silver Coin This is the first year a silver bullion kangaroo has been issued! The Perth Mint is a perennial favourite due to the quality and subject matter featured on their coins. 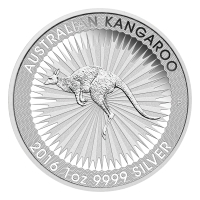 New for 2016, the Perth Mint has released a bullion quality Kangaroo coin to compliment the gold bullion Kangaroos that have been issued for years. The coin features advanced security features including a micro-engraved "A" in the letter A of Australia, as well as very finely engraved lines encircling the images on both sides of the coin. The kangaroo forms a part of Australia's national emblem, and is considered an unofficial symbol of the country. Add this attractive coin to your stack today!